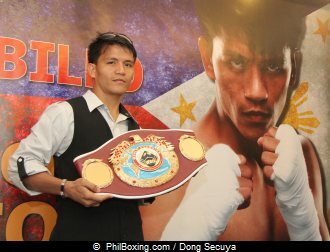 WBO minimum weight champion Merlito “Tiger” Sabillo will make the first defense of his title on July 6, possibly at the plush Solaire Resort and Casino in the Entertainment City along Manila Bay. Sabillo is undefeated with a record of 21-0 with 11 knockouts and will face No. 6 ranked Jorle Estrada of Colombia in a voluntary defense. The 24 year old Estrada who is five years younger than Sabillo has a record of 16-6 with 5 knockouts. The hard-hitting Sabillo won the WBO Interim title with a stunning 8th round TKO over heavily favored Luis De La Rosa who was fighting before his hometown fans in Colombia but couldn’t handle the aggressive Filipino. Sabillo was elevated to full champion after Moises Fuentes, who was struggling to make the 105 pound limit, relinquished the title and moved up to light flyweight where he failed to wrest the title from long-reigning champion Donnie “Ahas” Nietes who retained his title in a majority draw. Fuentes wanted an immediate rematch but ALA Promotions president Michael Aldeguer said they couldn’t accede to the request because Nietes suffered a nasty cut above the eye in that title defense and it took some time to heal. Fuentes has been guaranteed a mandatory rematch sometime in November following conversations between Aldeguer and Zanfer Promotions of Mexico who wish to stage the title fight in Mexico. However, Fuentes is scheduled to have a tune-up fight before then while Nietes will make a voluntary defense of his title in August although no deal has been finalized with his possible opponent as yet.